﻿ 3rd Series of Horse of a Different Color from www.fjordpony.com and Betsy. THESE WILL NO LONGER BE AVAILABLE AFTER MY INVENTORY IS SOLD! 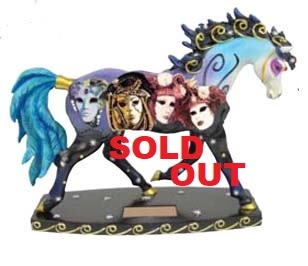 Presented by Westland Giftware and fjordpony.com. They are new in box and yes, 1E numbers. 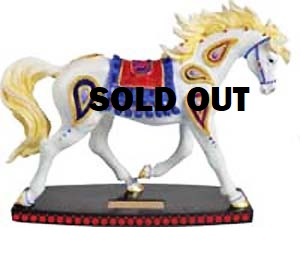 These are similar to Trail of Painted Ponies, but made by Westland. Read more at the other HODC pages. I will be happy to refund any extra shipping that is over-charged by the shopping cart. 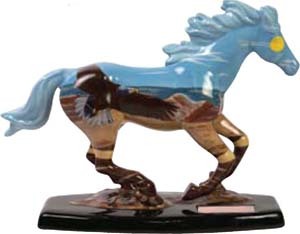 All who love horses, like to share their passion by collecting beautiful figurines like this collection from Westland Giftware. 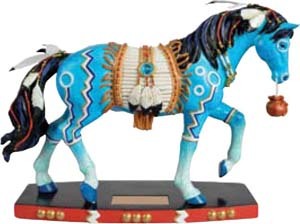 Like the Trail of the Painted Ponies, these 7" tall figurines have a story behind each design and have a numbered plate on each base. Only 10,000 of each were made so get into this Collectible. This line has been discontinued which means these will increase in value as they are no longer made. Venetian, Revolutionary, Lightbolt, Dancer, Western Leather & Carnevale. These will sure be a nice addition to the ornament collection. or Call me at 559-645-4111 PST to process your order. Money Orders & Checks accepted also.